The Blaster worm, also known as MSBlast or Lovesan, begins to spread on the Internet, infecting Windows XP and Windows 2000 computers. 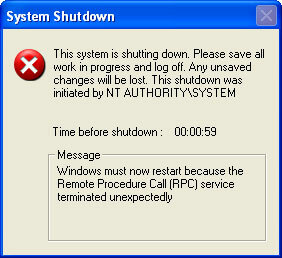 The primary symptom of the worm was the crashing of the RPC service, which would trigger the computer to shut itself down and reboot as shown in the graphic. Microsoft estimated the number of machines infected between 8 and 16 million. Damage caused by the worm was estimated at $320 million.